The Case of the Lopsided Turk - CHARTER SCHOOL WATCHDOG http://www.charterschoolwatchdog. In this series of emails the boys are mapping out training sessions on how to be a board members sitting on the board of United States' taxfunded charter schools that they not only run -- but likewise monopolize all of the school boards. 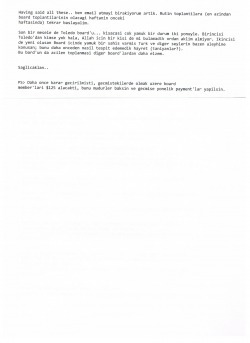 As of particular interest (although it is not news), the emails are in Turkish and are written by a Turkish guy sent to Turkish guys -- because the majority of the board members at their (our) schools are just that -- Turkish men (more old news). The boys are a bit disgruntled over their lack of ability to find an extra Turkish guy for their Toledo school board, and are instead -- stuck with a "lopsided'" Turk. Now we are not so sure on what that reference means exactly -- does it imply that the guy has scoliosis or that he questions what is going on in the board meetings (bad, bad boy)? We suspect it is the latter. Gulen's puppets are trained not to question authority (that would be the big guy and his minions), so if someone does -- they have to be outed and removed quickly as not to upset the status quo of the reigning cult mentality. We have a better answer to their dilemma -- let's remove all of the lopsided Turks and bring in American parents and citizens to sit on our publicly funded school boards. And as a side benefit, we will not have to hire a translator to read about what is going on with our school boards. Brother Ugur, after training last week, I wanted to send a comprehensive email, but you did it before me. But you could not explain the importance of the issue. Gecen haftaki training'den sonra bu isi ne kadare acemice ve tehlikelere maruz bir sekilde yaptigimizi cok daha iyi gorduk maalesef (benim dusuncem). Ugur Bey, ben ve Tahir Kasimov ordaydi. HErkesin bu training'i en kisa zamanda almasi lazim board islerinenin bekasi icin. Bu ayni zamanda board member olmanin geregi. Sahsen verilen bir dokuman vardi bu training'de.. onu pdf yapip (avukata sorarak) herkese dagitmayi dusunuyorum Hasan Kose abimin yardimiyla. Bu booklet baya guzel bisey bence. Conflict olan olaylari da cok guzel acikliyor. After the training, I understand that we are doing a very amateurish job and are open to danger (my thought). Mr. Ugur, me and Tahir Kasimov was there. Everybody has to take the training ASAP for the best of the boards. There was a document which was given in the training. I am thinking to convert it to a PDF file format and distribute to everyone (by asking the lawyer) with the help of brother Hasan Kose. This booklet is very good. It explains the conflicts. Board member'larin cogunlugunun (3 out of 5) biraraya gelip (board toplantisi haricinde) board islerini konusmasinin veya emaillesmelerinin kanunlara uygun olmadigini biliyor muyduk mesela (beni en cok soke eden bu oldu; birakin bizim conflict olan islerimizi gorusmeyi, 3 kisinin gorusmesi bile yasak aslinda (training'i veren, yillarca bu isi yapan charter yanlisi bir avukat). Did we know that it is legal to talk about board issues by using emails and meeting with only (3 out of 5) board members? Board'larimiz ayrildi artik, herkes board'unu toplasin bu hafta veya obur haftabasi. High ve Middle'inki ayin 10'unda olacakti ama bu haftaicine (carsamba haric zira denison ve noble yapacak o gun) alalim. Ilk toplantida yapilacak seyler arasinda Ugur hocamin da belirttigi gibi officer'larin belirlenmesi var. Onceki board'da resmi olarak bir treasurer ce secretary felan secmedik hic mesela. ByLaws'a imzayi sekreter atar ama sekreter kim belli degil. Butun yeni board member'larinin CV'lerinin mudurlere ulastirilmasi lazim. BCI check'lerinin de ASAP yapilmasi lazim. Yillik toplanti schedule'ini belirleyip hemen gazeteye ilan vermeli. 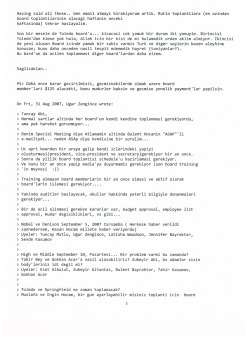 Board toplantilari icin 1 hafta onceden director'lar butun board member'larina email atacak agenda'yi (supporting documents ile beraber). Agenda toplantiya gelmeden belirlenecek yani. 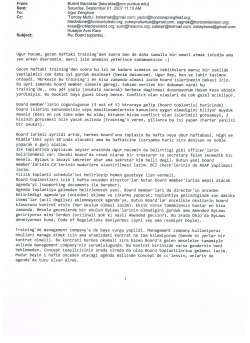 Board member'lari da director'in onceden belirledigi agenda'ya (onceden) ekleme ve cikarma yapacak; toplantiya gelindiginde son dakika items'lar (acil degilse) eklenmeyecek agenda'ya. Butun Board'lar oncelikle okullarin board klasorunu kontrol etsin (her okulun olmasi lazim). Eksik varsa tamamlansin bunlar en kisa zamanda. Mesela gecenlerde bir okulun ByLaws'larinin olmadigini gorduk ama Amended ByLaws geciriyoruz mins'lerden (orijinali yok ki nasil Amended gecsin?). Bu arada Ohio'da ByLaws denmiyormus buna, Code of Regulations deniyormus (ayni sey ama resmiyet boyle). Now, our boards are separated. Everybody meet with your own board this week or the start of the next week. One of the items of the first board meeting is as Ugur hodja said, to determine the officers. At previous board meeting, we did not select a treasurer and secretary. By-Laws are signed by secretary but we don’t know who the secretary is. We have to deliver the resumes of all new board members to directors. They have to make a BCI check ASAP. We have to decide the annual board meeting schedule and publish it on newspaper. Directors will email the agenda to all board members one week before the board meeting (with supporting documents). It means that the agenda will be decided before the meeting. Board members will make changes to the agenda and last minute items (if they are not urgent), and won’t be added to the agenda. All the Boards have to control the board folder of their school (each school should have one). All the missing documents must be completed ASAP. By the way, it is not called By-Laws in OHIO, it is called Code of Regulations (they are the same but it the formality). Training'de management company'e de baya vurgu yapildi. Management company kullaniyoruz okullari manage etmek icin ama aramizdaki kontrat ne tam bilemiyorum (bende bi yerler bir kontrat olmali). Bu kontrati herkes okumali zira bazen Board'a gelen meseleler tamamiyle aslinda management company'nin sorumlulugunda. Bu kontrat birinizde varsa gondersin beni beklemeden. Concept temsilcisinin arada sirada da olsa Board toplantilarina gelmesi lazim. Mudur beyin 1 hafta onceden atacagi agenda mailinde Concept de cc'lensin, onlarin da agenda'da tuzu olsun direk. At the training, the management company was emphasized too. We are using a management company but I don’t know the contract between us. (I should have one contract). Everybody should read the contract. Sometimes, some issues that come to board are the responsibility of the management company. If you have the contract send it without waiting for me. The representative of Concept should come to the board meeting sometimes. Directors should send the agenda which is sent one week before the board meeting to Concept by putting them in the Cc. field. Having said all this, I am giving up sending emails. Let’s start routine meetings (at least one week before the board meetings). Son bir mesele de Toledo board'u... kisacasi cok yamuk bir durum iki yonuyle. Birincisi Toledo'dan kimse yok hala, Allah icin bir kisi de mi bulamadik ordan aklim almiyor. Ikincisi de yeni olusan Board icinde yamuk bir sahis varmis Turk ve diger seylerin bazen aleyhine konusan; bunu daha onceden nasil tespit edemedik hayret (taniyanlar?). Bu bard'un da acilen toplanmasi diger board'lardan daha elzem. This board has to have a meeting more urgently than the other boards. member'lari $125 alacakti, bunu mudurler baksin ve gecmise yonelik payment'lar yapilsin. PS> It was approved before, including the past, that board members will get $125, and the directors have to check it and make the payments. olusturmasi(president, vice-president ve secretary)gerekiyor bir an once. Sonra da yillik board toplantisi schedule'u hazirlamasi gerekiyor. Training almayan board memberlarin bir an once almasi ve aktif olarak board'larin islemesi gerekiyor.... Yakinda auditler baslayacak, okullar hakkinda yeterli bilgiyle donanmalari gerekiyor..
High ve Middle September 10, Pazartesi... Bir problem varmi bu zamanda? Toledo ve Springfield ne zaman toplanacak? Under normal circumstances, each board has to meet by itself, but it seems that there is no movement. Since Bulent Hodja said ASAP, I told you it will be special meeting. Let’s ask him why it is ASAP. The three boards have to be together themselves and they have to form their own structure (president, vice-president, and secretary) . They have to do it ASAP and announce it to the media (fruit/results of the last board training). Audits will start soon, and they have to know enough information about schools. Also, there are decisions which have to be approved urgently, budget approvals, employee lists approval, director changes, etc..
High and Middle September 10, Monday. Is there any problem at the date? How can I reach to Mr. Tahir and Gokhan Acar? Zubeyir Brother, these guys were your bodies, weren’t they? When will Toledo and Springfield will meet? It is better to take this job very seriously. To Zubeyir brother only. The others do not read. Zubeyir Brother, I have your three different email addresses. Which one do you usually use? Subject: RE: Contract with Breeze..
benim de bir tuzum olsun mu? bu toplanti hangi okulun ve boardun toplantisi olacak? special meeting olacagina gore minuteleri olan resmi bir toplanti olacak diye anliyorum. degil. Aydinlatana simdiden tesekkur ediyorum. Which school’s and board’s meeting is it going to be? Since it will be special meeting, I think that it is going to be formal meeting with minutes. At the last meeting on which all the board members were on the same board, all members were sharing schools, I am not sure about what to do, or how to do it? I am thankful in advance to who can enlighten me. CC: "'ZUBEYIR ALTUNTAS'" <zubeyiraltuntas@gmail.com>,"'Tuncay Mutlu'"
This meeting can be a Special Meeting. Subject: RE: Contract with Breeze. > Bu board'lar konusunda bir toplanti daha yapalim derim ASAP. Let’s meet about the boards again ASAP. At the risk of sounding tedious and repetitive, note once again how the emails are from Turkish men going to Turkish men -- and once again, the Americans and women are conveniently absent. I'm going to quit sending emails -- sure! Can I help too? I love the way these guys are so willing to help each other -- sure wish they could share some of that solidarity with the American teachers and the taxpayers. 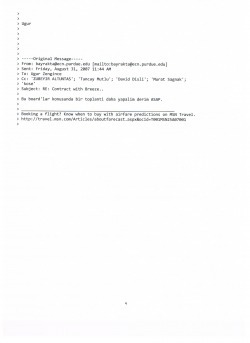 The guys sure like to send emails -- that's why we're pretty confident that despite Bayraktar's threat to cease -- this will be their predominant means of communication -- especially when it comes to things like school board activities/meetings and other school related business.